Amongst dizzy Himalayan heights, Kinnaur, once a forbidden land, is now a treasure’s trove for the daring and adventurers seekers. From the righteous greens of Sangla valley with well developed orchards of apricots and apples, to the magnificent panorama of Chitkul, India’s last village on Indo-Tibet border, and from the stunning sight of Mt. Kinner Kailash, abode of Lord Shiva from Kalpa, to the pristine lake at Nako village, mother nature’s portrait is an ever-changing one in Kinnaur. Lying on the ancient trade route between India and Tibet, ringed by the majestic Himalayan, Zanskar, and Dhauladhar ranges, Kinnaur with its well conserved culture and timeless rituals is a land of plenty. 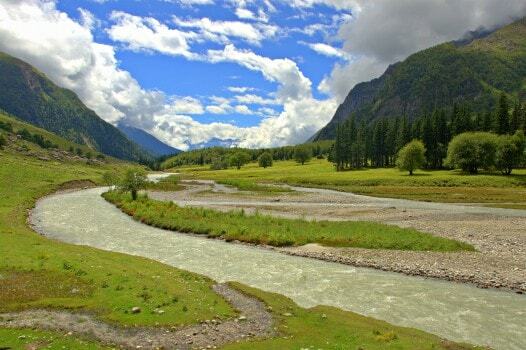 The gushing rivers – Sutlej, Spiti, Baspa and their tributaries – have over the centuries chiselled beautiful valleys across this picturesque land and nurtured one of the most hardy of mountain societies in the world. Kinnauris, as the natives are called, are proud yet friendly who can be easily spotted out by their striking cylindrical cap that features a half band of green, maroon or purple felt. Where lower Kinnaur has large influences of Hinduism with traces of Buddhism in their belief systems, in the higher reaches it is Buddhism that dominates. Kinnaur in a land where the two religions meet at the peaks and coexist in harmony. Languages spoken: English and Hindi is understood and spoken by people associated with tourism. However, the locals communicate in Kinnauri, the local dialect, in their everyday dealings. Clothing essentials: Owing to their high elevation, most parts of Kinnaur usually have a chill in the air round the year. The natives are mostly dressed in woollen clothes. In summers light woollens would be sufficient to live the days but heavy woollens and jackets need to carried along as it can get cold and chilly as the evening draws in. For winters, heavy woollens are essential. 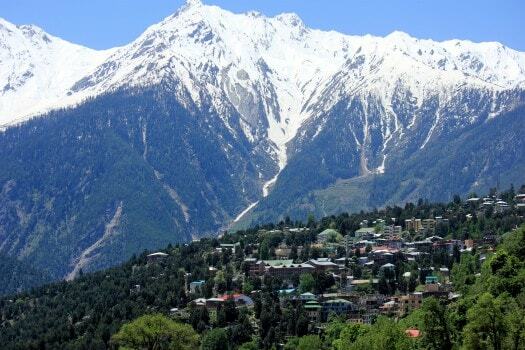 April to October is a good time to visit Kinnaur. In winters, starting from November, the temperatures start to fall and they do drop well below the freezing point in December and January. While low lying areas in the Sutlej and Baspa valleys receive heavy rains in July-August, the higher regions of the district are in the rain-shadow zone where it only snows. By Road: The route is on NH – 22 (The Hindustan Tibet Road). Buses and Taxis are available at Shimla and Rampur. One can also reach Kalpa via Manali – Rohtang Pass – Kunzam Pass – Kaza (400 Km). Regular bus services are available linking it to the other towns like Manali, Delhi and Haridwar. By Rail: Nearest Railhead (244 Km) is Shimla. By Air: Nearest Airport (267 Km) is Shimla. Kothi, also referred to as Koshtampi, is a large village between Reckong Peo, the district headquarter and Kalpa, higher up on the same hillside. With abundance of apricot, cherry and apple orchards around, an attractive temple in the middle and an awe inspiring view of Mount Kinner Kailash, this quiet village can leave any traveller spellbound. On the bank of river Sutlej, 33 km from Reckong Peo, Moorang is a village with idyllic Kinnauri settings. In spring that breaks out in April the apricot tree bloom transforms the barren landscape with abundance. The small Moorang fort is believed to have been built by the Pandavas during the Mahabharata era. Omrig, the local deity, revered in form of an ark made of gold, silver, and brass has 18 faces, with each face symbolising the 18 days of the epic Mahabharata battle where good ultimately triumphed over evil. Perched over the Tranda precipice, Nichar at an altitude of 2150 meters is amongst one of the most scenic places in Kinnaur. Blessed with a rich flora and fauna, luscious greens amidst rocky terrains of the higher region are a natural habitat for a variety of wildlife. The wildlife that is sighted around includes ghoral, antelopes, leopards and Himalayan black bears. One of the most revered temples of Sangla, the Bering Nag temple is a wood and stone structure built in the Pagoda-style architecture. In September, the Fulaich fair centered around the temple does attract a large number of tourists and devotees. The temple is dedicated to Lord Jagas, who is considered to be an incarnation of Lord Shiva. Crowned with a dome made of gold, the inner chambers of the temple are adorned with many precious gems. A Buddhist temple said to be founded by missionary Rinchen Zangpo (950-1055 AD), this institution initiates many with teachings of Buddha and other high Lama’s of the faith. The Hu-Bu-Lan-Kar gompa is in close proximity of Kalpa. On entering the monastery complex, you’re greeted by a white chorten in the centre and rows of prayer wheels all around it. 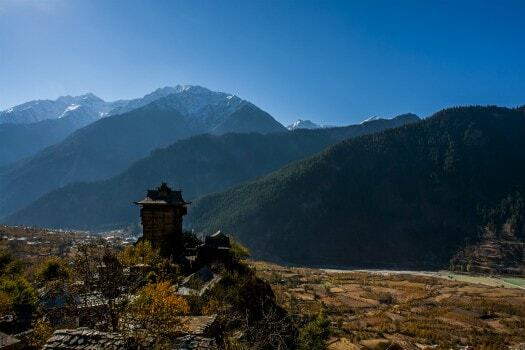 An exemplary demonstration of Kinnauri architecture, this temple at the edge of Kalpa village, is a stone’s throw away from Hu-Bu-Lan-Kar monastery. The temple features amazingly carved dragons coiled around porch pillars with the brass door opening into a courtyard and idols of Hindu gods peering out of the walls. The majestic view of Kinner Kailash peak through the temple window is a sight to behold. In its remoteness, the tough terrain does limit fine dining outlets. Kinnauri cuisine is largely basic and frugal comprising of wheat, barley, peas and other similar food items. Non vegetarians eat plenty of goat and ram meat. While there are no standout eateries, the best places are dhabas and snack shops where north Indian cuisine with Tibetan influenced dishes made out of coarse grains of buckwheat, millet and barley are served. Thupa, with meat chunks or vegetables and noodles dipped in a fiery curry is a popular dish. Butter tea (Salty tea), known as Thang, made by vigorous churning of butter, salt and special tea leaves is an energizing beverage to live out the cold winter days. Kinnaur mostly has are government run healthcare centers that do meet the basic needs of a traveller. To meet any serious emergency, one has to get to the regional hospital at Reckong Peo, Rampur Bushair or Shimla for want of better health facilities in these highlands. There is also an Ayurvedic hospital at Reckong Peo that treats patients with traditional medicine systems and a privately run Jindal Sanjeevani Hospital at Tapri provides allopathic healthcare services. Kinnaur is served by private and public transport services. State run public transport buses are conveniently available between any two destinations of the district. For those who can afford, taxis are the best way to travel to Kinnaur for a round trip. Good mobile phone connectivity is available at Reckong Peo, Kalpa, Sangla and other destinations. However, internet connectivity may be low in most other areas. Many trek routes and offbeat destinations may not have any mobile phone connectivity at all. A great display of the culture and rituals of the land, the Tribal Festival held every year from the last week of October into the first week of November at Reckong Peo, is a good time to be part of a society that has taken great pains to preserve its traditions. Better known as Baisakhi across north India, Beesh falling on 13-14 April is celebrated with much fanfare all over Kinnaur. For Beesh the local Devta gods are brought out of their temples and celebrations are held. Traditional community dances by men and women folk moving about in step in circular chains with some lively local drum beats playing about is a way of celebration of most functions across Kinnaur. Of the many festivals of Kinnaur, Fulaich is certainly the most charming one. It is a celebration to bid adieu to the passing of summer and accept the start of a long winter ahead. While Kalpa holds a most vibrant function, the festival carries its colours to every part of the highlands, which includes the scenic Sangla Valley. Every village sends out its members to collect flowers from the hillsides that are then gathered together at the village square. Fulaich, held in mid-September, is also a time when families hold prayers in memory of their departed ones. This village is situated 39 Km away from Kalpa on the left bank of river Satluj. The location is very beautiful and approach to this picturesque village is through apricot orchards. The local deity is Urmig and there are three structures dedicated to the deity each existing in Thwaring, Garmang and Shilling. Generally these are empty as the ark of the deity remains in the fort. On a sacred day the ark is taken to the above named places. The ark has got 18 ‘mukh’, made of silver, gold and brass. The 18 mukh represents the 18 days of the great epic Mahabharat. Last inhabited village on the Indo-Tibet border, Chitkul in Baspa valley is 25 km from Sangla. The motorable road ends at this village and any further journey has to be done on foot. In the rarefied air with some slopes of the highlands around the village sliced into terraced fields, a crystal clear River Baspa flowing through bestows immense beauty on this habitation. Camping by the river can evoke spirituality. The village has nice small temple dedicated to goddess Mathi, a local deity sitting in its centre. Any visit to Kinnaur is incomplete without a visit to Chitkul. From Wangtu on the Shimla-Kinnaur-Spiti highway, a road veers off to Kafnu. This village is the gateway to the scenic high altitude valley of Bhawa. Relatively untouched this valley is a nature trekkers haven. Kafnu is also the base to some of Kinnaur’s toughest treks that go over Pin-Parvati-Bhawa Pass to enter Kullu valley from one route and into Pin valley of Spiti from another diverging route. A diverging road from the Shimla-Kinnaur-Kaza highway that branches out from Powari, after a 7 km uphill drive gets to Reckong Peo, the district headquarters of Kinnaur. Peo, as it is better known, offers a breathtaking sight of the majestic Kinner Kailash peak (6050 m) across River Sutlej valley that cuts a deep gorge in between. The peak is believed to one of the many mythical residences of Lord Shiva in the Himalayas. Many pilgrims undertake a yearly trek to a 80 foot high vertical rock formation near the peak that is considered to be a ‘Shivalinga’. Where a ‘Parikrama’ (circumambulation) around the holy mountain base is an arduous eight day trek, a climb to the peak is a two day uphill walk. 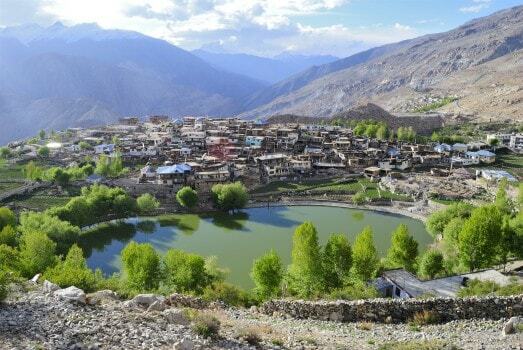 In Hangrang valley, this is one of Kinnaur’s most picturesque hamlets. At the commanding altitude of 3,662 meters, this village with a small lake and an highly revered Buddhist monastery has become very popular with tourists. A footprint-like impression cast on a rock is ascribed to Guru Padmasambhava, who is believed to have spread Buddhism to Kinnaur, Lahaul, Spiti and Tibet. Nako is also the base to reach Tashigang monastery and is the starting point for mountaineers setting out to scale Reo Pargial Peak. Nako is 115 km from Powari. Overlooking Sangla village stands the towering hill fort of Kamru. This wood and stone structure was the original seat of power of the rulers Kinnaur. 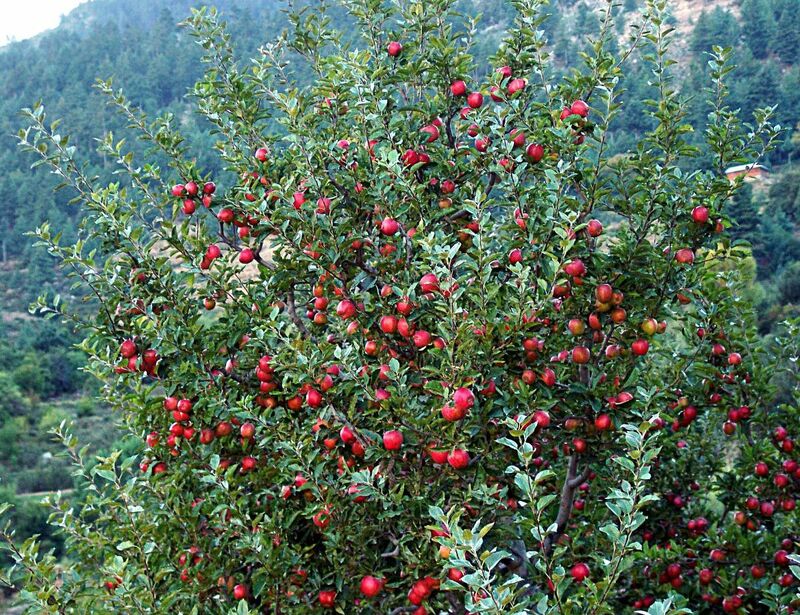 Kamru is a dense cluster of houses, surrounded by fields and orchards producing some of the finest apples of Himachal. The main wooden gate of the fort has the Buddha cast on it, whose blessings are sought before entering the village. A series of low gates in the hamlet lead to the fort that rises five stories high. The stronghold has an idol of Hindu goddess Kamakhya Devi (Kamakshi) enshrined in the upper storey. This idol is believed said to have been brought from Assam several centuries ago. The village also has a Badrinath temple. 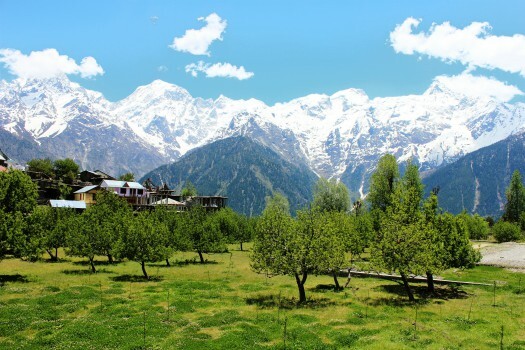 Going past Reckong Peo as you ascend higher (13 km) into the hillside, you reach Kalpa, a beautiful hill station with some breathtaking views of snow peaks to soak in. The small township retains a traditional ambiance. The finely decorated Narayan-Nagini temple is exemplary about the local craftsmanship, the Buddhist Hu-Bu-Lan-Kar gompa greets you with a white chorten and prayer wheels. Catering to the needs of many tourists who visit Kalpa each year, Himachal Tourism here operates Hotel Kinner Kailash at the hill station. Spread out from the scenic Nako village to Chango village, Hangrang valley has some well known trekking routes of Kinnaur. The desolate yet beautiful valley is famous for Nako Lake. In this rugged and barren with very little vegetation, much of the population makes out a living from sparse agricultural lands growing one crop in a year or by animal husbandry. 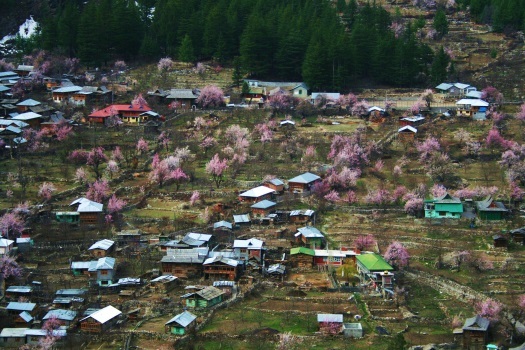 Growing one of the finest quality of apples in the state, Chango, at an altitude of 3,058 meters in Hangrang valley is largely a Buddhist village. There is also a monastery in the village. There are also three temples in the village which are dedicated to local deities. Famous for its local brews and edible pine nuts (Chilgoza) Ribba is 16 km from Powari. The village is also known as Rirang which in local dialect loosely means the mountain of Chilgoza pine nuts. One of Kinnaur’s largest settlements, Pooh is 58 km from Powari along the highway to Spiti. Besides an old Buddhist the countryside around this settlement has vineyards, almond and apricot trees, and an abundance of apple orchards. The local deity of Pooh, called Dabla, has neither a dwelling nor an ark. 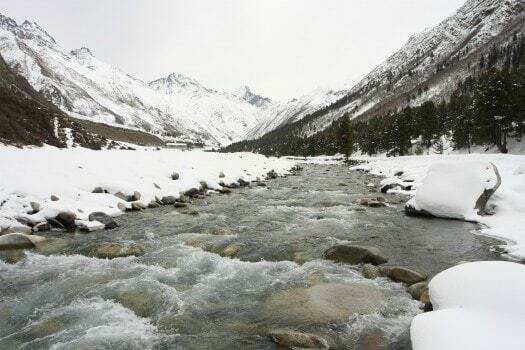 By the snow fed Taiti stream, Lippa is small village that can be easily reached from Kalpa or Reckong Peo. This village devotedly protects its rich heritage that is centered around three Buddhist monasteries. A rich wildlife region, Ibex and the elusive snow leopard can be sighted on the outskirts of the village and in the adjoining forest lands. Rolled out into upper and lower Kanam, this is a complete monastic settlement. To get to these well conserved monasteries, you have to take the 8 km diverging road from Spillo on the Shimla-Kinnaur-Kaza highway. The monastery overlooking the village commands considerable influence and is said to have been established by the missionary Rinchen Zangpo (950-1055 AD). Kanam at the base of the Nessang valley was a trading post of the old Indo-Tibet trade route. The village has 6 other smaller monasteries.